There is probably a built in mechanism in our culture's brain that the newest ideas and thoughts are better than older ones. Today's thinkers have the chance to stand on the shoulders of those who came before. I know I'm always looking for fresh new ideas in the books recently published, thus my almost weekly visit to the new book shelves at the Michigan State University Library. One doesn't have to travel far to recognize that some older works, many obscure except to a few readers, offer great insights usable today. That's why we read some of our more famous thinkers like Aristotle, Shakespeare, Plato, Darwin, Locke, etc. So I stumbled into a few terrific reads from the 1968-69 era within the same week. They were inspired from different sources. The first one I completed last week. 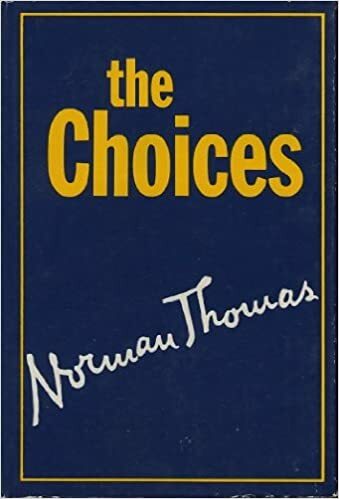 Simply titled The Choices, it was the final book of Norman Thomas' life. He completed it a month before his death at age 84 in December of 1968. Thomas was a remarkable figure of the 20th century from his early involvement against the first world war to his fight against American imperialism, inequality, and racism right up to his death. A Presbyterian minister, socialist, pacifist and six time presidential candidate from the Socialist Party, Thomas was considered one of the most powerful orators of his time. Having read and blogged on his biography last December I was compelled to find and read a few of his own writings. One of them was The Choices. Here, in his last political credo, Thomas reiterates his democratic socialism. But except on the issue of "universal disarmament" with UN control, almost any American will accept his views. The prescriptions stress flexible social planning and regulation of air and water pollution, natural resources and the birth rate. He advocates abolition of the electoral college, but pointedly scores the New Left for its "apotheosis of violence." The issues of racism, poverty, civil liberties and war also receive scrutiny. Throughout, Thomas indicates the choices he favors for deciding the world's future. There is a quiet gentle wisdom in this book. I find it amazing that his many political defeats failed to make him bitter or cynical. "I made my first important speech to a large audience in Madison Square Garden in 1917, in support of Morris Hillquit, the very able Socialist Party candidate for mayor of New York. The meeting dealt largely with the First World War, our entrance into which the Socialists had opposed. To fashion a world without war seemed to me a primary concern. I also believed that to attain peace, the world would have to concern itself with creating a world in which social justice prevails." Almost fifty years from that day, I made what tuned out to be my last speech in November 1967. I spoke before a large audience of labor leaders in Chicago. Once again, the subject was peace. After fifty tumultuous years, years which saw victory for what was the better side in two world wars, the United States was involved in a very cruel war in Vietnam, and living under the constant threat of a third world war. ... I am very critical of what is now called the Establishment in Washington, Moscow, or Peking, but I have great affection for my own country and confidence -- especially with the oncoming generation -- in its salvation. To use symbolic terms, I am one of those who desire to wash the flag, not burn it. I recognize that washing the flag requires more than political or economic group action. It requires personal action, your action in the ending of violence, the achievement of fraternity and honesty." Racial War or Racial Fraternity? It's hard to think of anyone of similar stature for our times. A voice that challenged the status quo with fervor, eloquence and passion. He may well have left us almost fifty years ago, but his ideas live on and are as timely as any written today. The second book was referenced in a footnote of something I read recently. The context of the citation, which I also can't recall, made it seem worth looking into. As it happens so I found an old paperback copy of the book on our bookshelves. One of those books you might find at a used book sale but never get around to reading. I have quite a few more of these! 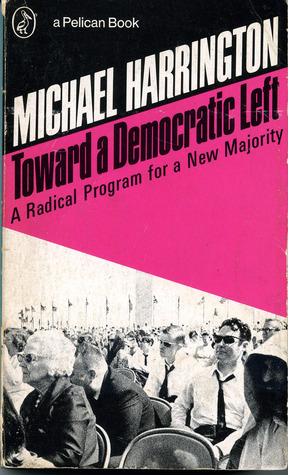 Michael Harrington was half Norman Thomas' age when he wrote Toward a Democratic Left: A Radical Program for New Majority in 1968. It is a longer and more scholarly approach to similar contemporary issues. Like Thomas, Harrington was a socialist and went on to form the Democratic Socialists of America which he led for a number of years before his death in 1989. He was most noted for writing The Other America which was credited with inspiring President Kennedy and Lyndon Johnson into creating the Great Society. He won the prestigious George Polk Award for that earlier work. Unlike Thomas who believed in changing the system through the Socialist Party, Harrington believed that one had to work through the Democratic Party and that appears to be the focus behind this book. I am only 50 pages into this 300 page tome so it's much too early to cast a final judgment on it. But early on I admire the temperament and the insights that again are so pertinent to our own times. "I see a lot of books presuming to explain what’s wrong with the economy and what to do about it. Rarely do I come across one with the consistent new paradigm frame, historical depth, practical sensibility, systemic analysis, and readability of Doughnut Economics by Kate Raworth. Especially unique and valuable is her carefully reasoned, illustrated, and documented debunking of the fatally flawed theory behind economic policies that drive financial instability, environmental collapse, poverty, and extreme inequality." It is clear to this reader, that we need to revisit ideas that were floating around years ago and meld them with the ideas that are emerging about how we move forward as one human family, on a single planet with one future.